Last week we published the first in a series of English video lessons produced by the Cambridge ESOL team, and today we are pleased to present to you the second video in that series. This time, the presenter offers some great tips for performing well in the speaking part of the Cambridge Advanced English (CAE) test. The CAE is the advanced general English examination provided by University of Cambridge ESOL Examinations in England. You can read more about it here. The CAE is actually more popular in Europe, but at Q Language we do occasionally help prepare students for this exam. Whilst the tips offered by the presenter (Jessica) in this video are geared towards the CAE, it’s worth noting that the advice given can also be applied to most other English speaking exams and, indeed, conversational skills in general, whatever the language. Hello, my name’s Jessica. Today we’re talking about the Dos and Dont’s of the Cambridge English Advanced Speaking Test, also knowns as CAE. As always, preparation is key! If you attend English lessons, make sure you get plenty of speaking practice in class, participating in groups and in paired activities. This will help you to interact effectively in the test with your partneter, by initiating discussion and responding to their questions and statements, and with your interlocutor, who will ask questions and give instructions. 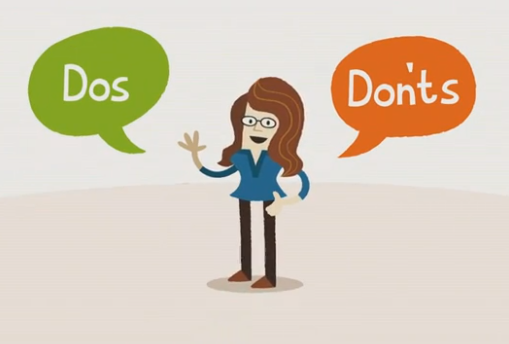 So, let’s move on to what you should do in a speaking test – the Dos – and what you shouldn’t do – the Don’ts – for the Cambridge English Advanced Speaking Test. Show that you can communicate effectively. Raise the level of your language above the mundane. Listen carefully to what your examiner has asked you to do and to what your partner says.ks set. Remember the instructions and focus on the tasks set. Involve your partner in conversation and create opportunities for them to speak. Also, listen to what they say and react to their opinions and statements. Don’t panic if you cannot remember or don’t know a particular word; just keep going and paraphrase instead. Don’t speak during your partner’s long turn. Don’t let your partner always take the lead, you also must initiate Don’t waste your opportunities to show the examiners what you can do. Don’t speak too quietly; remember, the examiners need to hear what you are saying. This will ensure you are in a good position to show the examiners what you are capable of. Find out more about Certificate in Advanced English here. Is CAE better than IELTS? CAE is the exam designed for those with an advanced level of English. It is more difficult that other exams as there is a minimum level for passing. Exams such as IELTS are graded from the absolute beginner to high-advanced so there is not a pass or fail grade. However, as a comparison, CAE would be equal to those at the IELTS level 7 or above. Hope this helps and happy studying ! I teach CAE and it is very hard to pass – even for native English speakers! Andre, as mentioned in this post, we do occasionally help students with preparation for the CAE exam, so please either email us or use the contact form on this page with your request and we will do our best to assist you. Meanwhile, here is a link to a good article that will help you with CAE Exam techniques. Both CAE and CPE can be quite challenging even for native English speakers. However, like most exams, how well you perform depends greatly on the amount of practice you put in and how well you learn the individual exam techniques; it is not purely down to your knowledge of the broader subject. Even native English speakers with a good command of the English language would need to put in a lot of practice as well as study the CAE Exam techniques rigorously in order to do well.